You've found the “U.S. Rhode Island Red Chicken Breeders” page here at Hobby Farm Wisdom! If this is the first time you have visited our site: Welcome! 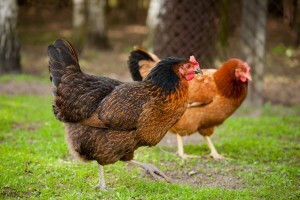 Rhode Island Red is an American breed of chicken that has been increasing in popularity for small and backyard farms. They are so highly regarded that the Rhode Island Red is actually the state bird of Rhode Island. These birds are popular because of their excellent egg production, exceptional meat and overall hardiness. Hens commonly lay up to 315 extra-large brown eggs per year her first year and 220 in her second. This exceptional egg production makes the Rhode Island Red a common breeding partner. Developed to handle New England winters, these birds fare extremely well in cold, harsh climates. Rhode Island Reds are rust-colored but some varieties exist in darker shades bordering on black.